In the mid-eighteenth century, almost 2,000 settlers, led by Edward Cornwallis, were sent to Canada by the British government, who wanted to establish a military support point to secure Great Britain's superiority over France. Shortly afterwards, it became clear that significantly more knowledge and settlers were necessary to properly colonize the region. 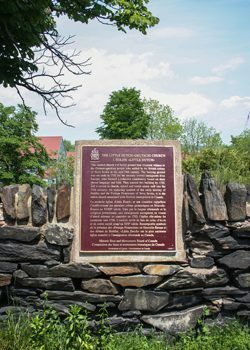 In the mid-eighteenth century, almost 2,000 settlers, led by Edward Cornwallis, were sent to Canada by the British government, who wanted to establish a military support point to secure Great Britain's superiority over France. Shortly afterwards, it became clear that significantly more knowledge and settlers were necessary to properly colonize the region. The British government offered free passage to North America, along with land in Canada for colonization, in exchange for settlers’ work in development efforts. Approximately 300 inhabitants from southwestern Germany (Württemberg and the Palatinate), Switzerland, and the French principality Montbéliard took them up on their offer. Upon their arrival in Canada, these immigrants were provided with the area north of the city palisades for colonization. A number of the settlers who had died of typhus on the voyage over were buried in a plot of land in this territory. 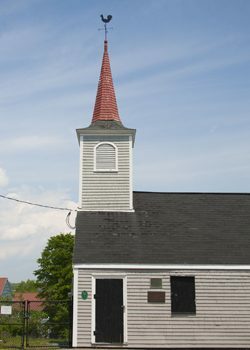 When it became apparent that the new arrivals had absolutely no knowledge of English, the “Foreign Protestants” (and the 3000 settlers who arrived in the following years from 1750 to 1753) were permitted to erect a German church, where they could practice their Protestant beliefs and perform mass in German. They decided to build it on the mass grave of the settlers who had died during the crossing. 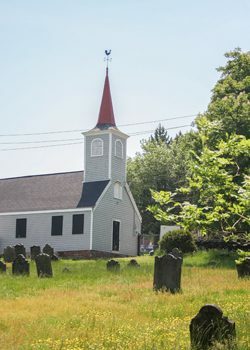 A simple wooden hut was built on the cemetery, and in 1760 it was outfitted with a church steeple including a weathervane, which was wrought from the blade of an old shovel, as was tradition. The congregation couldn't afford a pastor until 1786, so the schoolmaster Johann Gottfried Torpel led mass. 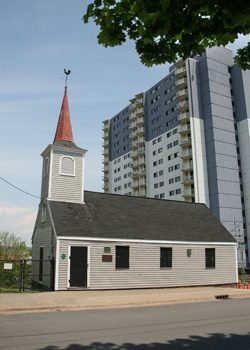 Eventually, the German minister Bernard Houseal came to Halifax in order to serve the German congregation as a missionary. Because of his popularity, he remained minister until his death in 1799, and was buried under the Little Dutch Church. The growing German enclave north of the palisades was often referred to as ‘Dutch Town’, derived from the anglicization and misunderstanding of the word deutsch, meaning ‘German’. In 1764, the community had a petition to name the area after the city of Göttingen. However, the name was used less often after Brunswick Street was established as the main thoroughfare, as it already referred to Braunschweig in Germany. Today, Gottingen Street enjoys the benefits of lower rents. It has seen growing popularity among locals and the opening of small alternative stores, and it is contributing to the gentrification of Halifax's North End.